The North Grenville Municipal Centre boasts a perfect environment for your successful and well-organized event. With two arena surfaces, community halls, lobbies and a performance theatre, the Municipal Centre is a versatile facility with a layout that can provide a broad range of space options, to suit your event requirements. If you are looking to host a conference, a wedding reception, dinner theatre, corporate training or another type of function, this is the place. Whether you use the whole Centre or a single room, our flexibility means that we can customize our facilities to match your requirements. See the floorplan. In addition there are two boardrooms which can accommodate up to 25 people each. We are recognized for our exceptional facilities and reputation for delivering outstanding service. Our staff bring knowledge, experience and a proactive approach to ensuring that your event runs smoothly. We work hard to mark your event planning easy! As you would expect from a modern venue, the technical, presentation and communications equipment are efficient and adaptable. The Municipal Centre is fully air-conditioned and offers wireless internet connection as well as in-house audio/visual services. You'll be struck by the comfortable, bright airy spaces, welcoming atmosphere and modern technological capabilities of our various meeting spaces. Our experienced staff will set up the room(s) as you require for your event or will be happy to assist you with ideas for layout. The North Grenville Municipal Centre is located in Kemptville, Ontario in the heart of North Grenville. 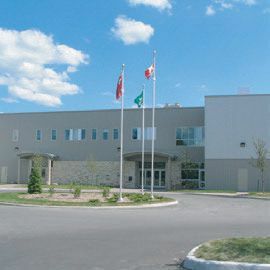 The Municipal Centre is strategically located on Highway 416, thirty minutes south of the Nation’s Capital, Ottawa, and Ottawa’s Macdonald-Cartier International Airport. We are approximately the same distance from Highway 401 and the U.S. border.